EoL NOTICE: The Ls series is going End of Life with a last buy date of the 30th of June 2019 with last shipments at the end of 2019. The suggested replacement is the California Instruments Asterion series. The Ls Series is an improved version of the classic California Instruments L Series AC power sources. 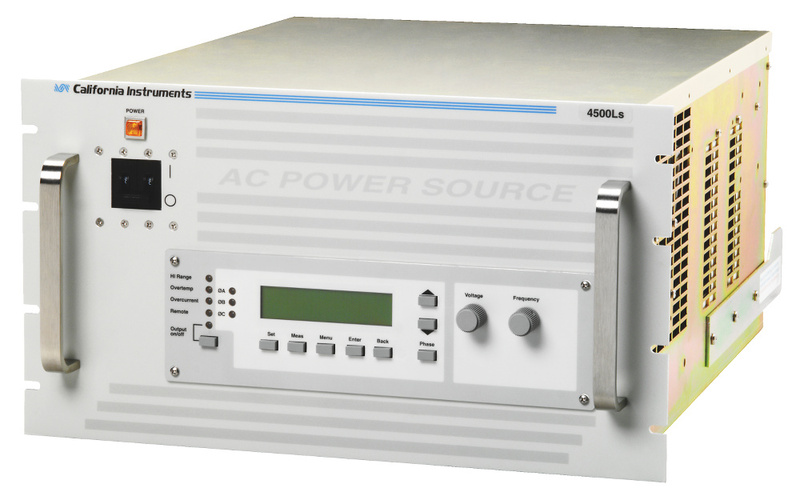 It provides many basic AC source capabilities at an economical cost. Additional capabilities such as arbitrary waveform generation and harmonic measurements can be added as options. The Ls Series can be ordered in either single phase (-1) or three phase (-3) configurations. Power levels range from 3 kVA to 6 kVA in a single chassis. Multiple chassis can be combined for power levels up to 18 kVA. The Ls Series is completely microprocessor controlled and can be operated from a simple front panel keypad. A pair of analogue controls located next to the backlit alphanumeric LCD display allows output voltage and frequency to be slewed up or down dynamically. For more advanced operations, a series of menus is provided using a dual line high contrast LCD.